Home FIFA FIFA 19 How to Qualify for the FIFA 19 Weekend League? FUT Champions is a huge success. If you want to make part of the most competitive FIFA 19 game mode, first you will need to qualify for the Weekend League. We will explain how you can do it. How to Qualify for FIFA 19 Weekend League? What do you have to do to play the Weekend League? Not everyone knows, but the FUT Division Rivals is not the only way to qualify for the Weekend League. Let’s analyse in more detail what have to be done to get the qualification for the FIFA 19 Weekend League. In FIFA 19 there are no DKTs, like it happened in FIFA 18 and previous titles. They were replaced by the FUT Division Rivals, which is very similar to online seasons (that were also replaced) but with better rewards. If you want to qualify for the Weekend League, you will need to join 2,000 FUT Champions points which can be done by playing FUT Rivals. This game mode is always available and have different rewards but no requirements. If you win a token, you are already qualified but you are free to continue playing FUT Rivals. Reaching division 1 will not qualify you anymore. The number of FUT Champions Points earned for each game is dependant on your performance and current Division. The better you play, the more points you earn. Each Division has a multiplier on your FUT Champions Points, so the higher the Division you are in, the faster you’ll rack up Points. You can see in the following table how many points you win in each match. Every Thursday morning, at the end of each campaign, you are also rewarded with a few FUT Champions points, based on your division and final rank. You can see in the following table how many points you win at the end of each competition. 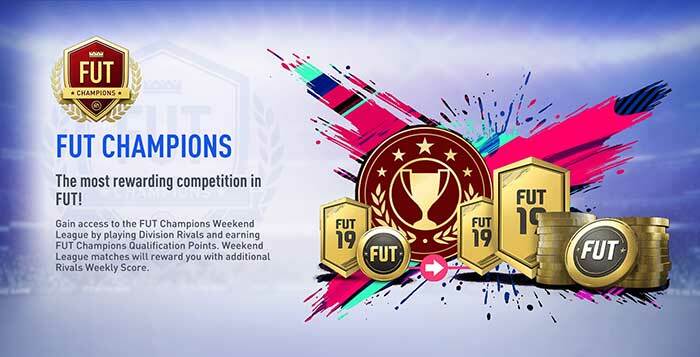 If you are a good FUT Champions player, you probably don’t have to play FUT Rivals to get qualified for the FIFA 19 Weekend League. All you have to do is to use your weekly matches to win the requested 2,000 points. The better you play, the more points you will get. This is valid for any of the platforms: PC, Playstation 4 or XBox One. Reaching level silver 2 will not qualify you automatically anymore. Starting at tiers with 11 wins or more, the rewards earned will include the full amount of points required to join another Weekend League. Additionally, every tier below 11 wins also includes some FUT Champions Points that will get you closer to another attempt at qualifying for the Weekend League. You can see in the following table the tier you need to reach at the end of the week to get the qualification. If you got disconnected a few times when you were trying to qualify for the Weekend League, there is an official tool that was supposed to auto-qualify you. However, it looks that it is not working. Only active FIFA 19 FUT Clubs were able to request FUT Champions Weekend League access. If this was your case, all you had to do was to go to the tool page and be sure that you were logged in. Since it isn’t working, the only thing that it does is inform you how many points you still need. We don’t know if EA will re-activate it or not. You must redeem your FUT Champions Points up to 24 hours after the start of the Weekend League you want to participate in. If you don’t redeem them in time, you can hold onto them to use in a future Weekend League. Sorry for the late reply. It depends on when you register. If you do it before the WL starts, then you will play on that weekend. So you have to redeem your 2000 points to enter the competition. I think you’ll be out of time if trying on a Friday but you can wait to redeem them after next week. When you get rewarded points on thursday for playing weekend league are they for the next weekend league or the one after that.? friday 7 of desember, 02.00pm i signed up to WL so i could play the 14-16 desember WL. All my points are gone, and im still not qualifyed….. what to do?!?!?!? I don’t know your timezone but at 2pm the WL has already started. If you lost your FUT Champions points, then you will have to contact the EA Support. Hello guys. This friday afternoon I managed to redeem an Weekend League entrance for next week competition (14-16 december), but I must say that the ongoing weekend league was already started when I redeemed my entrance(7-9 december). Sunday night I checked my account and surprisingly it appeared that I have 30 matches to play in the weekend league that already was going on ( altough my registration was after the competition already started). Now my points got reset to 0 but as I checked, it doesn’t show that I am qualified for 14-16 December Weekend League competition. Did I just lost all my points and WL entrance for nothing? Unfortunately WL started and I’m not qualified to play, my entrance vanished..maybe next year I’ll have enough points to play WL again..
Are you sure you have not registered prior to the WL start? In that case, please contact the EA Support. I’ve read all this and haven’t seen exactly when you have to “sign up” I qualified and it’s friday night and I guess I’m to late? Was hoping the weekend meant the weekend lol but do you have to sign up on Thursday? You have to do it before the start of the new round (Friday morning). You can do it on the console or on the Web/companion App. Okay but why? Why do we only have one day to redeem the points we got from the last weekend league? Why can’t someone who forgot to redeem Thursday or whose plans changed during the weekend decide to play? Why are you stopping people? WL ends every week on Monday and starts again 4 days later. EA needs 3 days to check that they are not rewarding cheaters which leave us only one day to register. That is correct. You use your points to register. Once you have done it, they come back to zero. If the WL is already running, you won’t be able to play it. However, you may use the points to enter in any future WL. Hi i already qualified for WL but i can’t join and it wrights 6 days until next competition how can i solve this problem ? Probably you are too late. You have to register prior to WL start. Good question. We haven’t tried. Anyone else tried this? In addition to this I have also played and earned enough points (2000) from my division Rivals Rewards for the week commencing 25th November – 1st November. As I have technically qualified twice for the FUT Champs, will I have 2x FUT Champs tokens to redeem when I wish to participate in any upcoming FUT Champs W/L? I have seen that there are 3 slots available on the FUT Champs W/L registrations page, do these stack up? If I am reading what has been said already in relation to only being able to hold a maximum of 2000 Champs points at any one time, What is the point of trying to qualify for the FUT Champs W/L in RIVALS if you have already qualified or able to qualify for the FUT Champs W/L by winning a minimum of 11 games out of 30? Taking into account that both FUT RIVALS & FUT CHAMPS W/L rewards are both delivered to players accounts on Thursdays, is it not extremely unfair that these 2x 2000pts (which have been legitimately won) by playing the required games do not stack up for use at a later stage? I really hope you can clear this up for me. Hi. First of all, let me apologize for the late reply. Yes, you can not hold more than 2,000 Champions points at a time, which means that all points you earn after you reach 2,000 points will be lost. The only chance to make use of the points you won, is redeeming your qualification as soon as Rivals rewards go out and keep the points you earned via WL to a future weekend. However, we haven’t tried to see if this works. Can anyone confirm this to us, please? Does WL pair you with similar standard players like in rivals or are you in with the best players? I’ve finally qualified this week but I’m in div6 so is there any point in me trying ? What time do I have to redeem my points at in order to qualify? You need to do it before the WL starts. I have 2000 points to qualify for WL. But this weekend I will be busy. I can’t play WL this weekend. Can I redeem my points in next weak or they will be lost? Yes, you can. If you can’t play this weekend, then don’t redeem your points now. Do it next week, before the WL starts. If I played only weekend league and Rivals at all, and in the Weekend League I made 11 wins, then play over a weekend league? Starting at tiers with 11 wins or more, the rewards earned will include the full amount of points required to join another Weekend League. I registered by accident, and it put me into next week when I’m away. Is there anyway of getting that token back? I finished gold 1 last weekend, which I have qualified, I went on fifa 19 this morning to register to play this weekend, and where it has got qualification progress, it states the tournament is closed, have i left it to late to register to play? You need to register before the Wl starts. When have you done it? Hi Rodrigo, I have 1600 Points and I think will be getting 2000 points today as I finished gold 3. I can qualify with 2000 points I am going to get as reward, but what about 1600 points? The self-service tool does not allow you access, it simply advises how many more points you require to gain entry. Please remove this false information from your content. Thank you. We were waiting for more confirmations. The text was updated. Division refreshes every Thursday morning. You have to perform well on FUT Rivals (and eventually on the previous WL if you have played it) to reach the qualification. Is weekend league division related or you play with people from every division ? Can i join Weekend league in the midle of the weekend? I got almost 2000 points but i dont get it yet. No. You need to redeem your qualification until the Weekend League starts. I apologise if this has already been asked but if come Thursday and I’ve not accumulated enough points for weekend league, will my points reset back to zero? No, you will keep with them. I got to gold 2 last wl. But im nog home this week. Can i qualify with companion? whats the point of qualifieing if you cant play? I got to gold 2 last wl. Byt in bot Home this week. Can i qualify with companion? No. You have to do it on your console. They will release an update in the coming weeks to fix that. I played last WL and i end up being gold 3 and today i went to playe my this week WL and i found out thatvi had to reedem the points thatbi didnt and thats hilarious that I can’t play this week.. is there anything that you can do for me to be able play WL this week? last year in weekend league you could qualify by winning 11 games is it the same this year or just the 2000 points? No, it is not. You need to get 2,000 points and redeem your qualification. As to my understanding, playing 1 WL match gets you a weekly score of 400 on division rivals. Does WL matches also affect skill rating or just the weekly score? When you play FUT Rivals you win the three: skill rating, weekly points and FC points. When you play Weekend League, you win weekly points and FC points, but not skill rating. so once you qualify and gain 2000 points and redeem your entry to the weekend league, the points start over and start building towards 2000 again even though the WL hasnt started yet. are these points adding towards the next weeks qualification? Yes, we believe you are correct. As soon as your points are ‘reseted’, you will be winning points for another round. hi I got the 2k points but I cant seem to redeem them can anyone help? It says my squad is eligble but I cant seem to play. You cannot use your token while a Weekend League is running. Once I accumulate the 2000 points, where should I go to redeem it? You receive a pop-up message asking if you want to redeem or leave to another weekend. You can also go to FUT Champions menu, I think. Thank you for your message. You probably are right but we are not 100% sure that it was removed. When we try to use it, it works but it says we don’t have enough points (which is true). Since there were no bad connections, we don’t have a way to test it. Anyone had success? Does anyone know when you need to submit your 2000 points for WL? Does this need to be done on a Thursday or can you join on a Friday/throughout the weekend? You need to do it before the competition starts. Say you don’t qualify by Thursday morning, and you get your weekend league points Thursday night (in rewards) can you qualify for the upcoming weekend league? As soon as you get 2,000 Chmapions points, you can qualify for the WL you want. All you have to do is to register before it starts. Once I qualify do I have to use the points for that weekend, will I lose the points if not? You can use them anytime you want. Once I qualify do I have to use it for the coming weekend or can you wait and use it another weekend or will it reset if I don’t use it? You can use it for any weekend you want. Until when I can qualify with Division rivals? Until the week of division rivals ends or until the weekend league starts? Because this got 1 day difference. You can enter on Weekend League until it starts. I am currently on Rank I on Division Rivals and i see the reward including 100 fut champ points. That means say i have 1500 fut champ points right now, i will have another 100 once the week concludes correct? But you said we may receive around 200 points at the end of the week? …and I was right. Rank I of Division 5 gives you 195 FC points. In your case, you probably are in Division 6 and for that reason, you will get 100 FC points this Thursday that will join to the 1500 points you have now. How many games should I win in fut champions to automatically qualify the next week? Hi, will fut champs qualification points stack up once you’ve reached the max 2000 points? is there a way of seeing any additional points gained? Yes, 2000 points is the highest amount of points you can reach. Feel free to ask us exactly what do you need to know. Will the champions qualification points expire after a weekend league ? And is it 2000 point EVERY week? Hi. Don’t forget that you also receive a few Champions points ate the end of each week on the FUT Rivals. How many points are we talking about here? For winning 32 gamin i 5-6 div is INSANE! Around 200 FUT Champions points. I am on division 6 and when I lose I get 9 points, not 10. Thanks. Thank you very much. We discovered the formula they use but we thought they rounded up the result. So if your I div 5 or 6 you will need to win 32 games.at least to qualify for WL. Who the hell has time to play all those games during week??. I guess I won’t be playing WL this year then. So no point in buying fifa 19. Going to cancel pre order. Parabéns pelo trabalho! Mas surgiu uma dúvida. Os fut Campeões pontos acumulam para a próxima semana? Ou zera? Great question. Pensamos que sim, mas carece de confirmação oficial. And a win in champions league = how many points? There are no Champions league matches in Ultimate Team game mode. will it be 40 games in weekend league again ? They changed to 30 just before the release.